I understand better now, tx Gérard ! The sense of wonder and awe in her eyes is enough to melt your heart. This is what the Christmas spirit is all about. 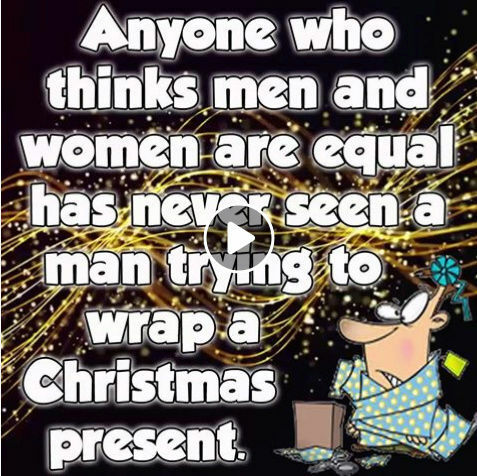 Men are hopeless in wrapping Christmas présents because they don't care ! MurielB a écrit: Men are hopeless in wrapping Christmas présents because they don't care ! Not everyone is worthy of your company and this is why. In other words it is better to be alone than in bad company ! Note the "go buy", without to, which is common in American. Having a dog is a great stress reliever. Research has found that human-dog interactions can give the same positive hormonal response that mothers have with their babies. We have had 2 dogs in our life and I agree that they are good for the family. I read another article stating that having a dog added 5 years to life. So 2 dogs for Pat and you... I know where the money of pension funds will be going. Tx Gérard, this is a very good piece of news !